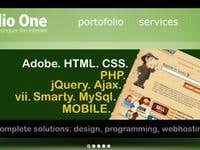 Company website: css, PHP, Smarty, jQuery. I am located in Cluj-Napoca, Transylvania region / Romania / EU and I offer professional and guaranteed high quality webdesign graphic concept, CSS3 /HTML5, responsive website development. Also I provide professional web hosting services. I am certified art designer with more of 20 years experience in graphic design, web design, multimedia and prints technologies.